European handball federation announced today the final list of the participants for the upcoming EBT Masters finals, that will be for the first time held in Romania. Baia Mare, the city at the northwest region of Romania will host the best teams of the Old continent. 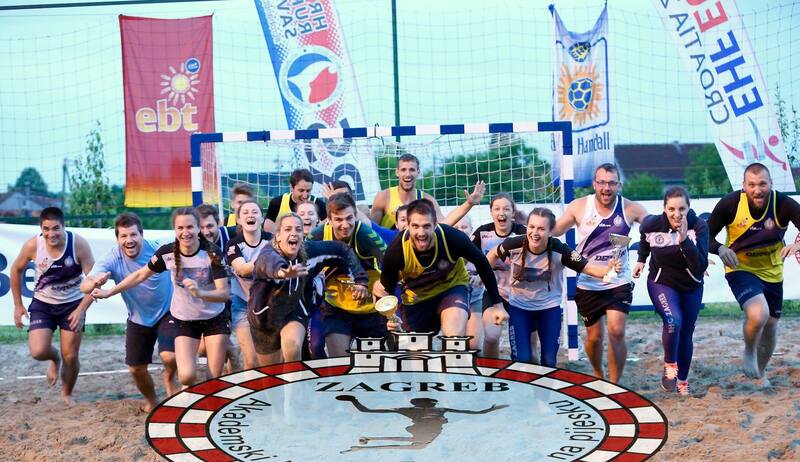 Academic beach handball club Zagreb will have the representatives in both categories. Beside Croatian representatives,another three clubs will have the teams in both categories, Portuguese GRD LEÇA - apostaganha.com, Serbian team from Bačka Palanka- BHC 2areg and Spanish CBMP Malaga. The following men teams will play in the group A: Palletways Veralia Azuqueca, the experienced team that is consisted of (former) Spanish national selection players, will try to reach the top of this top event. Another teams in group are the well known teams like TSHV Camelot, V.Gaw, BHT Petra Plock, Ekaterinodar, and BHV Wasserschloss. In group B, tough matches will be played agains BMP Sevilla(ESP), Beach stars BHC (HUN), GRD Leca-apostaganha.com(POR), BHC 2areg (SRB), 12Monkeys (GER), HE Beach handball (DEN), and wild card team Tricolorii (ROM). 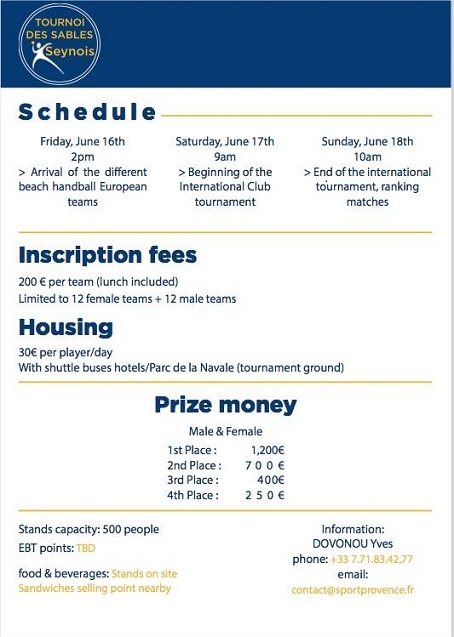 Romanian team Tricolorii and Danish team HEI Beachhandball are newcomers in this elite team list, and they will also definitively contribute to the quality of this event. The teams in the women category include CBMP Algeciras (Esp), BHT Pyrki Poznan (POL), Westsite Amsterdam (NED), Detono Zagreb (CRO), SPORT CLUB Senec-Cannabis Energy Drink (SVK), Multichem-Szentendrei N.K.E. (HUN), E.F.E - Os Tigres(POR), OVB Beach Girls®DVSC-TVP (HUN), BHC 2areg (SRB), CBMP Ciudad de Málaga (ESP), CAIPIranhas(GER), GRD LEÇA - apostaganha.com (POR),UKS Varsovia Warszawa (POL),Beach Girls(ROM). The playing system includes group matches, after which the quarterfinal matches will be played. The coach of the Detono Zagreb women team,Ivan Jugović, said: I am really happy that our girls qualified to the EBT Masters finals, eventhough I am sorry that Croatia will not have another representative team,BHC Kontesa Nera at the same time. It will be a real challenge for our young team to compete at Masters finals and we can just say that it will be a nice experience for us. We will do our best in order to reach the quarter and semifinal matches-that would be a great thing for this young players. From the beach handball point of view, it is great that this sport reached another country with great handball history. Few years ago Romanian federation started to invest in beach handball by sending the younger age categories to the European competitions and we can expect their further development. During the first day of the EBT Masters finals Detono Zagreb achieved two victories and go with maximal 4 points to the second part of preliminary round. This weekend in Italian city of Gaeta the closing tournament of European Championships in beach handball a.k.a. EBT Masters Finals will be held. In men's category Croatia will be represented by BHC Detono Zagreb, whilst in women's category that honour will have WBHC Kontesa Nera. First in the history French EBT tournament! ABHC Zagreb continues Polish-Croatian cooperation. Who would have thought, two years ago, when for the first time on the pitch of ŠRC Jarun a foreigner appeared, that this is the beginning of one long and beautiful story that continues today. In 2014, together with AKRP Detono Zagreb players, Polish girl Adriana Chowańska began her first beach handball season. 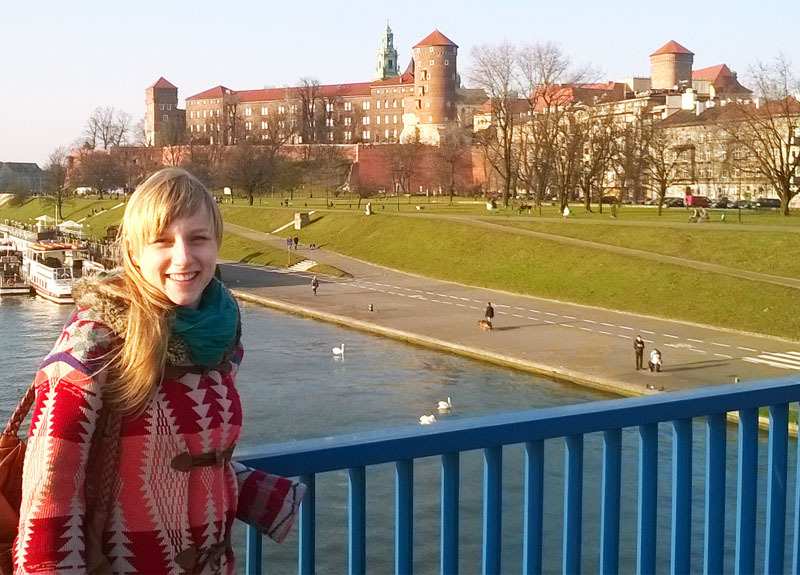 Everything thanks to Erasmus exchange that enabled her to study in Zagreb for summer semester 2014. That time Adriana was a Croatian philology student at the Jagiellonian University (Cracow) and an active player of her university club. Right at the begging of her stay in Croatia she began to look for handball club where would continue trainings and in the same time improve her Croatian. It was the coincidence that led her to our club, which starts the preparations in April.